Director Denis Villeneuve has become known for making very visceral, thrilling movies. His last two films were the stomach-churning Prisoners and the purposely abstract Enemy, both of which aren’t so much seen as they are felt by their audiences. Villeneuve’s newest, Sicario, is more of the same. Sicario stars Emily Blunt (Into the Woods, Salmon Fishing in the Yemen) as Kate Macer, an FBI agent who, after a disastrous raid in which half of her team is killed, is recruited by a Department of Defense agent named Matt Graver (Josh Brolin from Inherent Vice and Oldboy) to go after the men responsible. Kate is asked to team up with a mysterious Colombian operative named Alejandro (Escobar: Paradise Lost‘s Benicio Del Toro) to work on a War-on-Drugs assignment with an ultimate objective that she doesn’t quite understand. As their mission takes them back and forth between Mexico and America, and Kate’s life is put in danger time and time again, she begins to wonder if Matt and Alejandro are actually on the level, or if they’re making it up as they go along. Like most movies that deal with the Mexican drug cartels, Sicario is violent, bloody, and disturbing, but it’s also thrilling, suspenseful, and exciting. The screenplay, written by Taylor Sheridan (better known as Deputy Hale on “Sons of Anarchy”), is an over-simplified treatment of Traffic (think of it as Traffic without the extraneous characters and parallel subplots), but it’s far from a point A to point B narrative – there are more than a few good twists and turns in the road along the way. The plot reveals itself gradually, but the movie can hardly be called a slow burn; it’s more of a pot-boiler. And once that pot is boiling, all hell breaks loose onscreen. 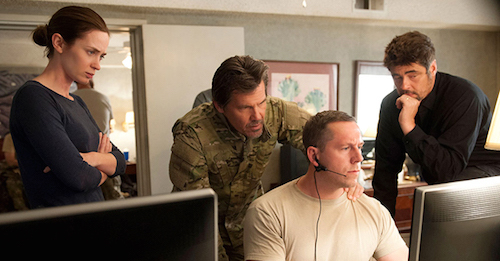 At first, Sicario feels a little unclear and overwhelming, but that’s kind of the point. Initially, the audience feels confused by everything that’s going on, but gradually, they begin to realize that they are just identifying with Kate’s character – she doesn’t know what’s going on any more than they do. Kate and the viewer are along for the same ride, and the true intentions and objectives of the movie are revealed to both at the same time. If it’s an intentional thing, and Denis Villeneuve’s body of work gives us no reason to believe that it is not, then it is genius. Put next to Villeneuve’s other films, Sicario isn’t quite as good; it doesn’t provide the gut punch of Prisoners, nor does it have the philosophical anarchy of Enemy. However, Villeneuve on a bad day is better than most filmmakers on a good one, and Sicario is another hit for the director. Sicario was shot by the legendary cinematographer Roger Deakins (Unbroken, Prisoners), and it looks as good as anything that the celebrated director of photography has done. Although the movie includes plenty of sweeping landscape shots of Juárez, Mexico, the border town was deemed too dangerous for filming, so the part of Juárez was played by the Mexican city of Veracruz in the movie. The American sections of the film were shot in Albuquerque and El Paso, and between those locations and the Mexican ones, the entire film has a very hot, dry, suburban desert-like look to it. Deakins uses plenty of motion, attaching his camera to cars, cranes, and dollies in order to get shots that careen, follow, and stalk the subjects. Sicario is packed with disturbing imagery, but Deakins has a way of shooting his subject that makes even the ugliest of scenes look beautiful. Whenever possible, Deakins uses wide angle shots that just let the action unfold organically and naturally without the aid of cuts or close-ups. Other times, Deakins and editor Joe Walker (12 Years a Slave) team up to create some truly genius match cuts. Roger Deakins is the perennial Oscar bridesmaid, having been nominated twelve times but never winning, and the last two years, he’s been beaten by the same man – Emmanuel Lubezki (Gravity, Birdman). On the strength of Sicario, this may be Roger Deakins’ year, although Lubezki does have The Revenant releasing later this season, so who knows? Oscar or not, Deakins’ work on Sicario is definitely praiseworthy.